You customers are insatiable! Each year, it has to be more—more blood, more gore, more frightening masks. Each year, they get more terrifying. We’ll have you know that we just haven’t had a good night’s sleep in years because of your unquenchable desire for the gruesome. Yeah, we have nightmares on the regular and it’s all because of masks like this Cleave Mask. Just look at this thing. Really, look at it. It’s so terrifying that we can barely stand to look at it for more than a few seconds. It has faux hair on top, to create a realistic look. It has painted “blood” all over it. It even has a molded meat cleaver planted right in the middle of it, making anyone who wears it look like the victim of a serial killer. That’s not to even mention the eye that looks like it’s popping out of its socket. The whole thing is… ugh. Gross. 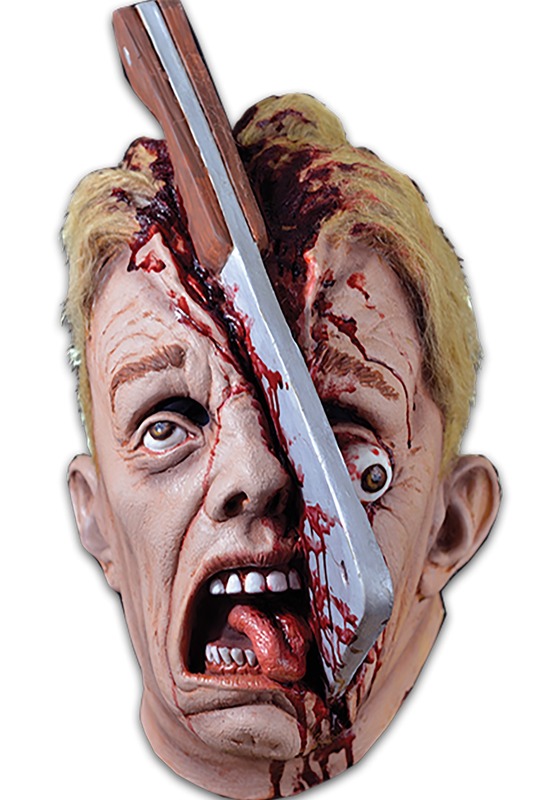 But we keep hearing feedback to get more gruesome masks with scarier details, so here it is! Don’t mind us, because we’re going to head to bed so we can have a few more nightmares starring this horrifying mask.